» Refactoring: How Do You Clean a Mess? Here’s the code smells exercise as we left it last time. Let’s continue to focus on the the first section, which sets placeholders for two text fields. (Reminder: the names textField1 and textField2 aren’t descriptive because I anonymized a section of real code.) Our goal is to move this logic into the view model. Last time, we made progress by moving the strings from the view controller into the view model. We did this so that the view model could have everything it needs to manage the conditional logic. This is the logic we want to move. Notice how each clause of the if-else statement is changing both text fields. Remember my hint above? “Do one field at a time.” This is harder to do when they’re entangled with each other. So, separate them. Duplicate the entire block of code above, so that we have two. Remove lines with textField2 from the first block. Remove lines with textField1 from the second block. This illustrates a common refactoring goal: Move related things closer together. Move unrelated things further apart. Refactoring goal: Move related things closer together. Move unrelated things further apart. At this point, you may be frowning a little. We started with 7 lines. Now that’s grown to 11 lines. Wasn’t refactoring supposed to make things more expressive? Did we make things messier? This is like organizing a cluttered closet. Everything is hidden when the closet door is closed. But inside, it’s a mess. In fact, that mess is slowing you down. So one day, you decide to invest time into organizing it. But it’s hard to tell what’s what, so you pull everything out. Now your closet is empty (and ready to receive things in an orderly manner). But everything that used to be in there now lies scattered across the floor, and on top of your bed. What a mess! This is a typical phase during a series of refactoring steps. Don’t panic! All we’re doing is exposing the mess that was hidden before. Like the stuff in the closet, the code is now easier to deal with, one thing at a time. Again, it feels like our formerly compact code is bloating. But remember, we’re making a mess to clean a mess. This is all part of teasing the code apart into moveable chunks. Refactoring seems to make a bigger mess, at first. You end up with more chunks, but each chunk is easier to move. Whether automated or manual, the result of the extraction is a new method. Copy the code from the source method to the target. Adjust the method to make it work in its new home. Disclosure: The book links below are affiliate links. If you buy anything, I earn a commission, at no extra cost to you. I’m still using my copy of the 1st edition. 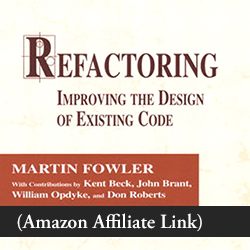 Martin Fowler has probably changed the wording in the newly-released 2nd edition. I’m quite eager to get it! So I copy the placeholder1() function, and paste it into the view model. Since this new method is inside the ViewModel struct, delete its references to the viewModel property. Turn the source method into a delegating method. 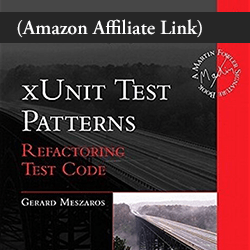 Run tests to confirm. …And that concludes our Move Function refactoring! Since it has no arguments, change it from a function to a calculated property. Repeat everything for the second text field. Each move is automatically verified. Lean on automated refactoring when it’s available. Larger refactorings are composed from smaller ones. Teasing apart functionality seems to make a bigger mess, at first. You end up with more chunks, but each chunk is easier to move.